The equestrian world has a capital city. Many comparisons have been made in the attempt to underline the standing of the CHIO Aachen, the official tournament of the Federal Republic of German: For instance it has been called the Wimbledon of equestrian sport or the Mecca of the equestrian sport world. The Federal Chancellor, Angela Merkel said, “The heart of the equestrian sport beats in Aachen.” The most successful international female show-jumper, Meredith Michaels-Beerbaum, pragmatically stated “Aachen is Aachen.” Precisely. There are a number of things that make the traditional CHIO event at the Soers in Aachen so special. The most prestigious competitions in the world are staged here in extraordinary stadiums: Whether it is the ROLEX Grand Prix of the show-jumpers in front of 40,000 spectators or the dressage competition, the Deutsche Bank Prize, in the spectacular Deutsche Bank Stadium – competing in Aachen is pure fascination and at the same time a great challenge. “Riding with goose bumps” is how the athletes describe what it is like to be immersed in this atmosphere and experience the special moments that are unique to Aachen. The most prestigious competitions in the world are staged here in extraordinary stadiums, for example the main stadium of Aachen. Tens of thousands of people hold their breath in the main stadium with its memorable square-like shape with rounded corners. Not a sound can be heard apart from the hollow thuds of the horse’s hooves in the huge stadium, which is the size of two football pitches. And then? If the poles remain in place, the tension suddenly subsides and the crowd starts cheering and if a pole falls, thousands of spectators groan in unison. Visitors come from all over the world, a mixture of all sorts of languages can be constantly heard all over the showgrounds. And yet both elation and disbelief sound exactly the same in any language. Triumph and tragedy lie very close together here at the World Equestrian Festival in the Soers of Aachen. And we even have our own stadium for those who revel in the fascination of dressage. The cutting-edge Deutsche Bank Stadium holds 6,300 spectators and they form the fascinating setting for the proud horses. Not just the stadiums, also the short routes are what distinguish the CHIO grounds. The DHL Prize, the cross-country competition of the eventers and the Marathon of the four-in-hand drivers are just a few steps away. And the Albert-Vahle Arena, where the world’s top vaulters battle it out for a place on the winner’s rostrum, is just a few metres in the other direction. The CHIO Aachen has long since joined the league of major international events. “Aachen stands for equestrian sport, in the same way that Bayreuth personifies the opera,” the journalist Stefan Aust explained. Guests from all over the world visit Aachen, show business, sport and media stars stroll over the red carpet, celebrities from the business and political world meet up while enjoying fantastic sport. And somehow it is quite natural that Aachen is the hub of the equestrian world. After all, according to the legend, Carl the Great’s horse once discovered the hot springs when pawing the ground with its hooves and in doing so determined the site where the Imperial Palace and City of Aachen were later to be built. 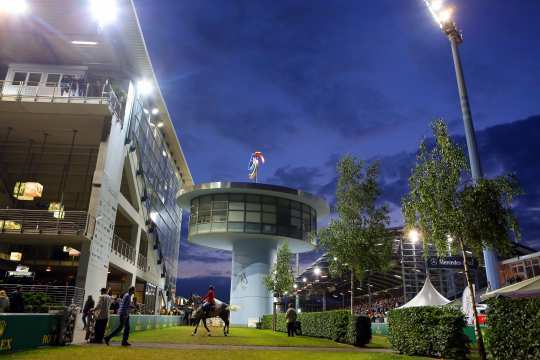 World’s best riders, vaulters and drivers and their top horses will be competing at CHIO Aachen 2019 over a period of 10 days. In addition to top sport in the disciplines jumping, dressage, vaulting, driving and eventing, the visitors can also look forward to an exciting supporting program at the Soers in Aachen. In the scope of the Horse & Symphony on July 13th, the wonderful music of Aachen’s Symphony Orchestra will meet fantastic equestrian sport in the Deutsche Bank Stadium. On Soers Sunday, the showgrounds are open to the public free of charge. The CHIO Aachen, the CSIO Spruce Meadows Masters (Canada), CHI Geneva (Switzerland) and Indoor Brabant The Dutch Masters (Netherlands) have joined forces to create the Rolex Grand Slam of Show Jumping. Get more information here and under: www.rolexgrandslam.com. Dogs: It is forbidden to bring dogs to the tournament grounds.